That’s the famous line by John Wanamaker well over 100 years ago. 100 years and most business owners are still no clearer to knowing which half is working for them and which half is wasted. 100 years ago you had an excuse. There was no such thing as conversion tracking, there were no tracking phone numbers or QR codes or any of the modern tools marketers can use now to track the success (or lack thereof) of a campaign. It’s still not a perfect science – there’s no accounting for human behaviour and people always find a way to circumvent the sophisticated tracking tools but it’s a lot easier than ever to monitor your spending and get a clearer picture on what’s working and what isn’t. What are the ways you can track your advertising? These days we’re really spoilt for choice when it comes to tracking advertising spend and what you choose depends on where you’re advertising. Below I’ve outlined a few of the most common ways you can monitor your spend. Tracking Phone Numbers – This is a specific phone number that you use for an advert so each advert you post has it’s own number meaning that you can easily know which adverts are working and which are not. Using a company such as ResponseTap (who we use) means you can have as many numbers as you need and you get a weekly report that details all the calls you’ve received, whether the call was answered and how long it lasted. They also provide other services such as call recording and even a post-call survey. Their service can also track the effectiveness of the ads you post on Google Adwords too. Google Adwords (or any Pay Per Click adverts) – All online advertising is track-able and it all really started with Google Adwords back in the turn of the century when they realised how to monetise their growing search engine. For each advert that you post on Google, they will monitor the number of times it’s viewed, the number of times the link on the advert is clicked and, if you add their special code to your website, they’ll track how many visitors completed a set action on your website (for example, buying from your store). They’ll even add their own Tracking Phone Number to your advert so you can monitor calls from their adverts. Facebook, Twitter and all the other online advertising platforms also produce data that provides similar evidence of success but they all do it in different ways so it can be confusing if you’re using them all. Landing Pages – Probably the simplest way to track the success of an advert is to promote a unique page on your website. For example, if you want to promote a sale on a particular product you create a page dedicated to that product and the sale price. So this could be something like www.yourdomain.com/sale where you show the product and the offer price. You then track all the visits to that page and as it’s only shown on the specific advert then you know how much traffic that advert has generated. Tracking URLs – If the thought of creating loads of landing pages sounds like too much work then you can use tracking urls such as the ones that Google can create (see https://goo.gl/). These work by taking your standard link (say to your home page) and changing them into a unique code. For example, I’ve created a tracking code to our home page https://lobsterdigitalmarketing.co.uk which looks like https://goo.gl/DIxqHn. I’m sure you’re looking at that link and thinking it’s not great for using on an advert but there are ways to resolve that issue. For example, if your website uses WordPress then there are plugins that can redirect a URL to a web page that will look a lot more attractive to your audience. Also, Bitly provide a similar service to goo.gl that will allow you to create user friendly URL’s. Facebook Lead Ads – Last year Facebook launched a new advert type called Lead Ads. These are forms that users are presented with on response to an advert that collects certain data relevant to the ad. For example, if you’re running an event and wanted to get a feel for interest in the event then you can run a lead ad that your audience can complete to show an interest in the event. The benefit of this ad type is users don’t have to leave Facebook to complete the form (you could just as easily have a form on a page on your website after all) but users generally don’t like to leave the Facebook environment and your form can have user data pre-loaded saving them time when completing the form, thus making it more likely they’ll complete the form. LinkedIn have recently launched a similar ad type. QR Codes – I must admit, five years ago I thought this was going to be huge in the U.K. By that time it was already hugely popular in places like Japan and the benefits of using the codes were obvious so surely it was just a matter of time before we saw the small, square bar-codes on every advert. It didn’t quite work out like that and looking back I can see why – they’re pretty ugly and the wasn’t really a push from the marketing industry to promote them to advertisers. However, their benefits are still there and when used in clever ways they provide a very useful link between traditional media advertising and online marketing. You may have seen a QR Code on adverts but they look like square bar-codes that you scan with an app on your phone (requiring an app is another reason why they haven’t taken off). Once you scan them the information in the code can activate a function in your phone. For example, it could as simple as activating your phone’s browser and going to a web page or it can even add an event to your calendar or even start a phone call. Once you start tracking how do you evaluate your advertising? So hopefully you’re now using one or more tracking methods with your advertising but you still need to use that information to work out which half of your spend is working and which isn’t (and then drop the half that isn’t). What about all those other marketing efforts you’re using to promote your business – networking, word of mouth, customer referrals…? How are you tracking those? 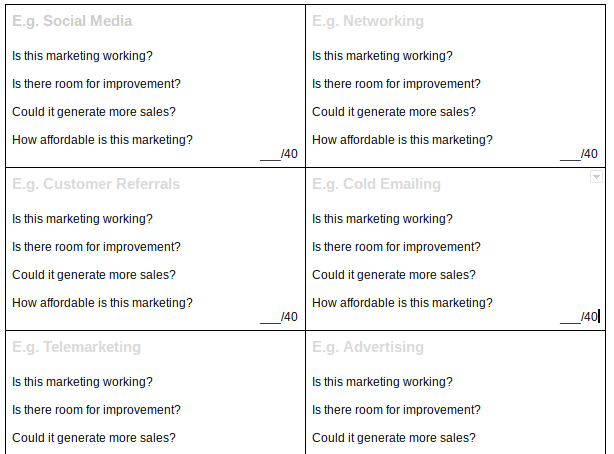 As a business owner I’m sure you have a general idea of how well each of your other advertising/marketing efforts is working for you which is why I put together the following tool – a simple way to evaluate all your advertising and prioritise the efforts that are working and which need improvement. The tool is very simple in its methodology. You simply score each type of advertising/marketing you’re actively using in four ways out of 10 – Is this marketing working?, Is there room for improvement?, If improved, would it generate more sales? and How affordable is the marketing? I’ve used the phrase “How AFFORDABLE is the marketing” deliberately. This is because even the most expensive forms of advertising can be affordable if they’re generating a return on investment so it’s a call you have to make when answering that questions – differentiate between affordable and expensive and it will differ from business to business. What’s affordable for one business won’t be affordable for another. Do this for all the marketing you’re doing and soon you’ll start to see which ones are scoring better than others. Then the question is, do you persevere with low scoring advertising or drop it in favour of the marketing that is working and can be easily improved to generate more sales. I’ve put together a handy worksheet for this in my Marketing Plan Workbook that you can download using the form here. When you download the full Marketing Plan Workbook you can work through each section to design your own marketing plan for your business, or just pick out the Marketing Review and see how well your marketing is currently performing and where you can make improvements. PreviousDo you have control of your online marketing?